Ginger – Amfri Farms Ltd.
Ginger is a knobby, multiple “fingered” rhizome with light to dark tan skin with occasional rings. The thickness of the skin depends on whether the rhizome was picked early or when more mature. The flesh is firm yet fibrous. Ginger is aromatic, pungent and spicy. Gingerol is the primary compound that gives fresh Ginger its spicy pungency, when Ginger is dried its flavor is intensified (gingerol converts to shogaol) and when cooked, Ginger is less pungent (gingerol converts to zingerone). Gingerol is related to capsasin, the component that gives chilies their spiciness. Ginger is well-known for its use in treating nausea and indigestion. The rhizome contains terpenes and an oleo-resin called Ginger oil, which along with other properties in the plant, act as an antiseptic, lymph-cleanser, circulation-stimulator, and induce perspiration in order to cleanse the body of toxins. Ginger contains protease, which gives the rhizome its anti-inflammatory properties. Ginger tea is used often to maximize the nutritional benefits. Whether eaten raw, cooked, candied or dried, ginger root has vast culinary purposes. It is an essential pantry ingredient within the kitchen; most often used as an herb. To prepare Ginger, remove the skin by scraping it off with a spoon, or remove it with a knife. 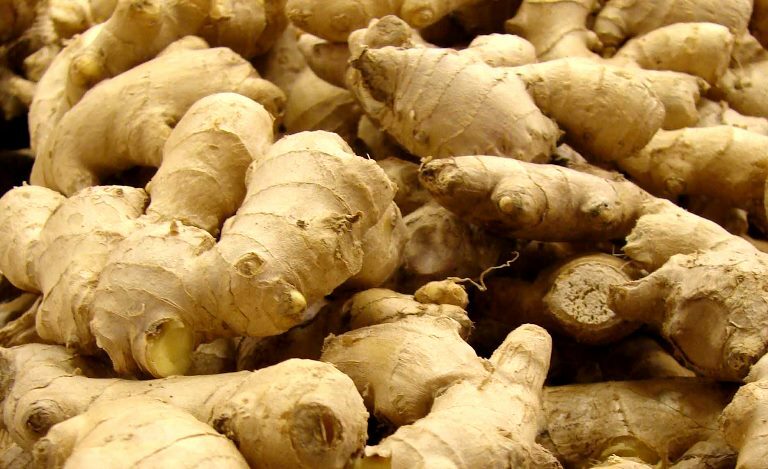 Ginger root can be used in dressings, marinades, stocks, purees and confections as well as in drinks such as Ginger beer and tea, smoothies and juices. To store, refrigerate in a paper bag in the crisper drawer, or grate the entire root, lay in a line on a sheet of plastic wrap, wrap and twist ends tightly, then freeze. Ginger can be crystalized, candied or pickled for preservation.